Posted on August 07, 2013 at 9:00:00 am by Michelle M.
Do you tinker, create, or fabricate for fun? Do you love to learn how things work? Are you creative or fascinated by technology? Then you’ll want to check out the 2013 Fort Wayne Regional Maker Faire! Powered by TekVenture, the Maker Faire celebrates the inventor and the creative genius in all of us. You’ll find amazing displays of engineering and invention alongside crafts and homemade clothing. The Maker Faire isn’t just about technology and engineering - the variety of inventions will surprise you! From fire art, to robots, to urban farming, there’s something for everyone. It doesn&apos;t matter if you&apos;re creating gizmos and gadgets fit for a world spy, or love creating one of a kind pieces for the home. This is an opportunity to learn and discover what others are making. You’re sure to be fascinated by the variety of projects on display. While this is a local even, there are Maker Faire&apos;s all around the country - and even the world! The original Maker Faire took place in San Mateo, California and celebrated 7 years of creativity in 2012. The World Maker Faire takes place in New York, and draws over 50,000 attendees and 500+ makers. 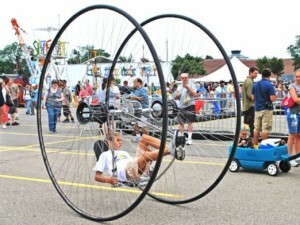 Other places Maker Faire&apos;s take place in include Detroit, Kansas City, New Castle (UK) and Tokyo, Japan. The Fort Wayne Regional Maker Faire is a part of surge in community-based, independently created Mini Maker Faire&apos;s popping up across the country and around the world. The Fort Wayne Regional Maker Faire 2013 will take place September 14-15 at Headwaters Park East - Lincoln Pavilion. Tickets are just $10 for adults and $6 for children ages 6-14. Volunteers are also needed for this year’s event. Fort Wayne Trails will provide free, safe, and secure bicycle parking for anyone riding their bike. While the 2013 program schedule isn’t available just yet, keep an eye on their website ,or Visit Fort Wayne, learn more as it’s published.